Sowdering About: Our overdue Christmas post. 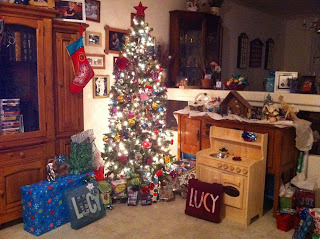 This year was a super special Christmas for us because it was the last Christmas Lucy had as an only child. I wanted to make it great, so I tried to make an advent calendar that ended up being a complete disaster because it fell apart, but Lucy seemed to like it. Each day leading up to Christmas, we tried to do some sort of Christmas activity. We missed some days, but for the most part, we were successful. We started out decorating the Christmas tree. 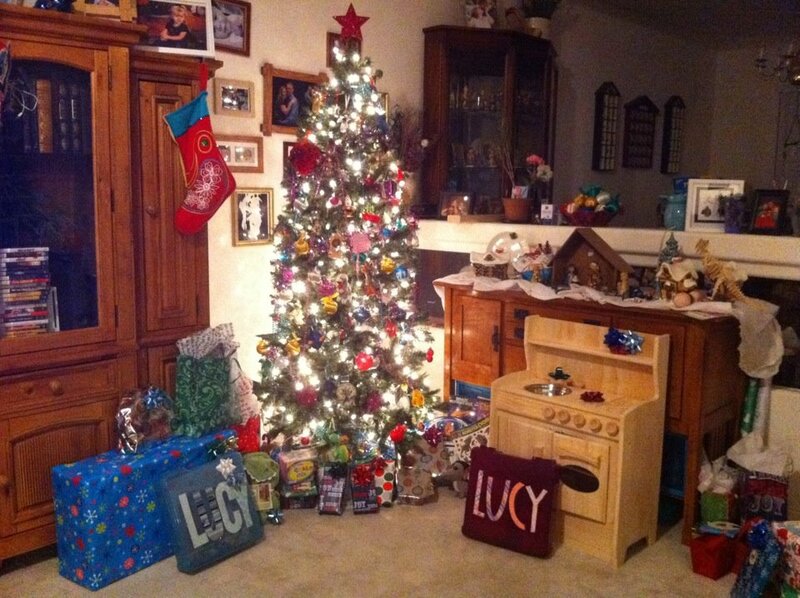 Lucy was really into it this year and was very particular on where she put the ornaments. She was also very excited to help me unpack each one. 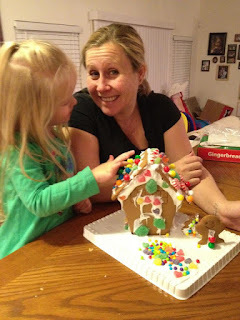 We also made a gingerbread house. This was highlighted by Lucy's constant movie quotes from the Shrek Halloween special that she was obsessed with for a while. She kept saying "This is Gingy's house and I am going to eat him"
We hit up the mall to see Santa where Lucy asked for a robot. She was very timid, but it was super cute. 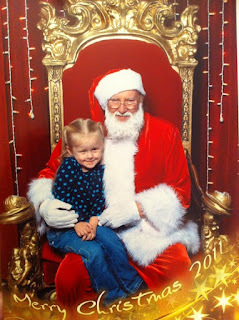 She was so excited to see Santa. And then each year I host a cookie swap where I invite my friends over and they bring cookies with recipe cards and we all swap recipes and eat lots of cookies. 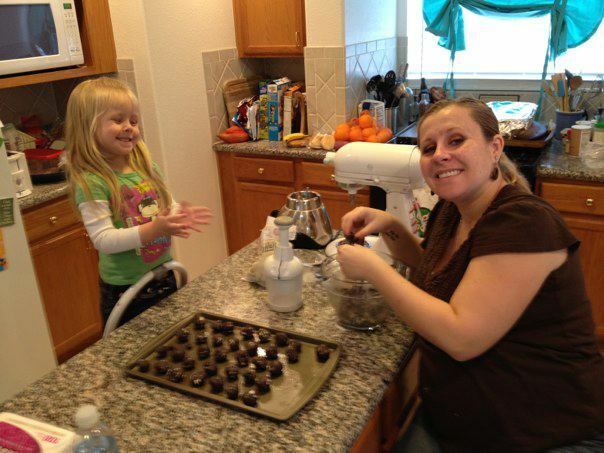 Usually I go all out and bake about 9-10 different kinds of cookies and usually have a house full of people. My table is NEVER big enough for all the cookies. This year however, it was a little smaller, I only made these black and white truffles and I didn't invite nearly as many people, nor did I really follow up if people were going to make it. Oops on my part, but really, I was exhausted. Matt had just graduated with his Master's the day before and we had his family over for a big luncheon and I was still working on Christmas presents so it was really a miracle that I didn't just cancel the party entirely. But it was still nice, and I really appreciate not only the people that made it, but I appreciate that they were able to tolerate me for as long as they did. A tired pregnant Randi is not always the most fun to be around. Lucy helped me this year and as you can see, she had a blast, and she did a great job too! We also took a day out to visit the Bellagio atrium. Each season they switch it up and it really is a beautiful place to go. As usual it was jam packed, but Lucy really liked seeing the penguins and the polar bears. If you are ever in Vegas, this is one of my favorite places to go. And best part, it's free! Christmas Eve always starts what I like to call our "Christmas Marathon." It starts with breakfast with Matt's family as CE is Matt's mom's birthday. After the birthday breakfast this year, we all went to the movies. And after the movie, we ran home, changed clothes grabbed our gifts and headed to my mom's. We had a light lunch, opened gifts, spent some time with my mom's side of the family and then headed to my dad's. This year was a litte extra special at my dad's because my grandpa Jim and grandma Jackie came to town. Also, my Uncle Billy and his wife Marilyn were there too. It was the first we all had been together for a holiday in a lot of years. It was really nice too. The kids had fun together, the food was FABULOUS (as usual because my step mom is a great cook) and the company was great. It really was a great time. We got home and read "The Night Before Christmas" and "The Grinch Stole Christmas." We made cookies for Santa and laid out carrots for the reindeer too. Lucy even wrote Santa a letter. After we tracked Santa around the world using Google Maps, Lucy was sent to bed when he was somewhere in South America. Santa made his stop at our house leaving Lucy with some great goodies. Christmas morning we set our alarm to wake up early because we had part 2 of our marathon to complete and wanted to make sure we got where we needed to be on time. Lucy had snuck into our bed somewhere around 4 am, so when our alarm went off at 7, we just turned over and woke her up. She started with her stocking that was full of goodies. And then she made her way to the gifts, which included two of her very own scrapbooking totes full of scrapbooking supplies so she can scrapbook with me, a kitchen, a Dora the Explorer doll house, some movies, and a set of three nerf guns so that Lucy, Matt and myself can have shoot outs at the house. When all the presents were opened, we got showered and dressed and headed to Matt's sister's house where we had a late breakfast and opened presents with his family. Matt only took video however of Lucy opening present and even though he said I can do screen shots from his phone of the video I don't know how to do that, so those pictures will have to wait. All in all it was a great Christmas. We ended it at home with Lucy cooking us dinner in her new kitchen and us watching Toy Story 2, which I don't know how, but I had never seen before. It truly was a very nice couple of days, and as much as the holiday's stress me out because there is just so much to do in such a little time, I am kinda sad they are over. I do know that I am looking forward to having Christmas with both kids next year, and the advent calendar I will make for next year will rival all others. I will have more energy and we will get through all the activities. 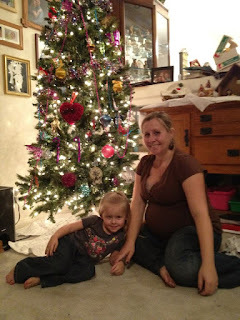 It's really hard to believe that this time next year, we will have two kids and one of them will be almost a year old! I hope everyone had just as great of holiday as we did! Special Kid with Special Parents....Happy New Year!!!! I love Lucy's sideways glamour shot in front of the tree!